Software development is activity that uses a variety of technological advancements and requires high levels of knowledge. Because of these and other factors, every software development project contains elements of uncertainty. This is known as project risk. The success of a software development project depends quite heavily on the amount of risk that corresponds to each project activity. As a project manager, it’s not enough to merely be aware of the risks. To achieve a successful outcome, project leadership must identify, assess, prioritize, and manage all of the major risks. The goal of most software development and software engineering projects is to be distinctive—often through new features, more efficiency, or exploiting advancements in software engineering. Any software project executive will agree that the pursuit of such opportunities cannot move forward without risk. Because risks are painfully real and quite prevalent on all software projects, it’s critically necessary that stakeholders work hard to identify, understand, and mitigate any risks that might threaten the success of a project. For projects that have time and cost constraints, our experience shows most clearly that successful software development efforts are those in which risk mitigation is a central management activity. What Is Risk In Software Engineering? Very simply, a risk is a potential problem. It’s an activity or event that may compromise the success of a software development project. Risk is the possibility of suffering loss, and total risk exposure to a specific project will account for both the probability and the size of the potential loss. 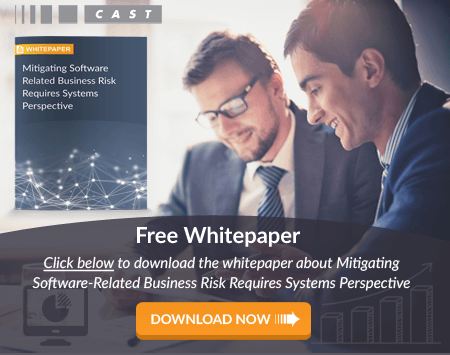 What Is Risk Management In Software Engineering? Risk management means risk containment and mitigation. First, you’ve got to identify and plan. Then be ready to act when a risk arises, drawing upon the experience and knowledge of the entire team to minimize the impact to the project. Most software engineering projects are inherently risky because of the variety potential problems that might arise. Experience from other software engineering projects can help managers classify risk. The importance here is not the elegance or range of classification, but rather to precisely identify and describe all of the real threats to project success. A simple but effective classification scheme is to arrange risks according to the areas of impact. New, unproven technologies. The majority of software projects entail the use of new technologies. Ever-changing tools, techniques, protocols, standards, and development systems increase the probability that technology risks will arise in virtually any substantial software engineering effort. Training and knowledge are of critical importance, and the improper use of new technology most often leads directly to project failure. User and functional requirements. Software requirements capture all user needs with respect to the software system features, functions, and quality of service. Too often, the process of requirements definition is lengthy, tedious, and complex. Moreover, requirements usually change with discovery, prototyping, and integration activities. Change in elemental requirements will likely propagate throughout the entire project, and modifications to user requirements might not translate to functional requirements. These disruptions often lead to one or more critical failures of a poorly-planned software development project. Application and system architecture. Taking the wrong direction with a platform, component, or architecture can have disastrous consequences. As with the technological risks, it is vital that the team includes experts who understand the architecture and have the capability to make sound design choices. Performance. It’s important to ensure that any risk management plan encompasses user and partner expectations on performance. Consideration must be given to benchmarks and threshold testing throughout the project to ensure that the work products are moving in the right direction. Organizational. Organizational problems may have adverse effects on project outcomes. Project management must plan for efficient execution of the project, and find a balance between the needs of the development team and the expectations of the customers. Of course, adequate staffing includes choosing team members with skill sets that are a good match with the project. After cataloging all of the risks according to type, the software development project manager should craft a risk management plan. As part of a larger, comprehensive project plan, the risk management plan outlines the response that will be taken for each risk—if it materializes. To be effective, software risk monitoring has to be integral with most project activities. Essentially, this means frequent checking during project meetings and critical events. When a risk occurs, the corresponding mitigation response should be taken from the risk management plan. Accept: Acknowledge that a risk is impacting the project. Make an explicit decision to accept the risk without any changes to the project. Project management approval is mandatory here. Avoid: Adjust project scope, schedule, or constraints to minimize the effects of the risk. Control: Take action to minimize the impact or reduce the intensification of the risk. Transfer: Implement an organizational shift in accountability, responsibility, or authority to other stakeholders that will accept the risk. Continue Monitoring: Often suitable for low-impact risks, monitor the project environment for potentially increasing impact of the risk. Throughout the project, it’s vital to ensure effective communication among all stakeholders, managers, developers, QA—especially marketing and customer representatives. Sharing information and getting feedback about risks will greatly increase the probability of project success. Always be forward-thinking about risk management. Otherwise, the project team will be driven from one crisis to the next. Use checklists, and compare with similar previous projects. Prioritize risks, ranking each according to the severity of exposure. Develop a top-10 or top-20 risk list for your project. Like most project managers, you can probably reuse this list on the next project! Vigorously watch for surfacing risks by meeting with key stakeholders—especially with the marketing team and the customer. As practicable, split larger risks into smaller, easily recognizable and readily-manageable risks. Strongly encourage stakeholders to think proactively and communicate about risks throughout the entire project.